Zune Coming to Canada / Outside US in Spring! Robbie Bach just announced that Zune is no longer US-only! 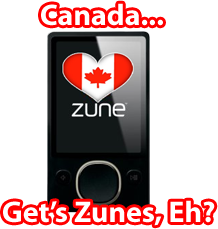 Come Spring, Zune will be coming to Canada and other non-US countries. Stay tuned! EDIT: I just looked over the Engadget write-up, and they have the quote as "For the first time we'll begin selling the Zune outside the US, in Canada." So it looks like it's Canada-only for now, but still, pretty cool.